In a frying pan, frying the bacon lardons for 4-5 mins. Removing from pan onto kitchen paper, then add the chicken to the same pan. Fry until the chicken is cooked through (check by cutting a piece in half and ensuring it is white & opaque all the way through). Place this to one side and allow to cool. In a separate pan, heat olive oil and fry off the bacon lardons until they start to crisp and brown around the edges. Place this to one side to allow to cool. 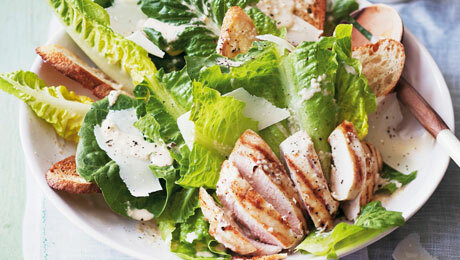 Separate the cos lettuce leaves into a large bowl and add a generous 5-6 tablespoons of Newmans Own Caesar dressing. Add in the chicken pieces and bacon lardons and stir to combine. Place in a serving bowl and top with croutons and additional parmesan shavings if desired.